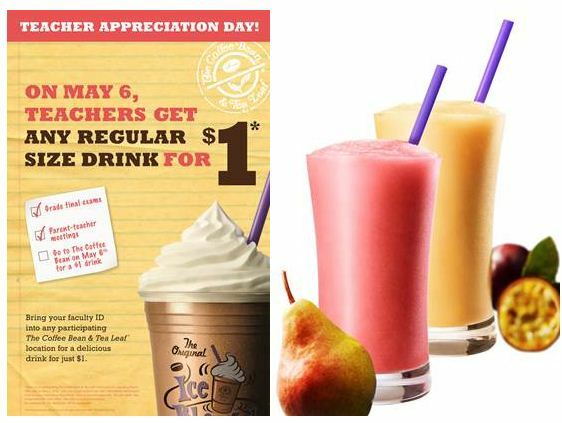 Teacher can get any one regular drink at Coffee Bean & Tea Leaf on May 6 for $1 only with teacher id. 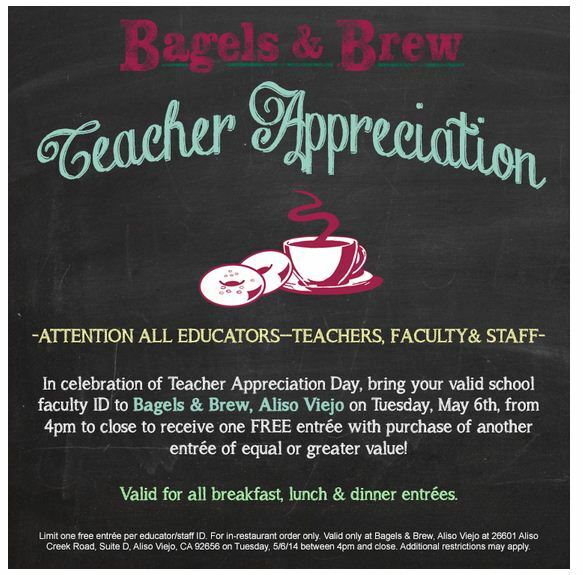 Bagels and Brew is offering buy one, get one FREE entrees for teachers at their Aliso Viejo location with teacher id. 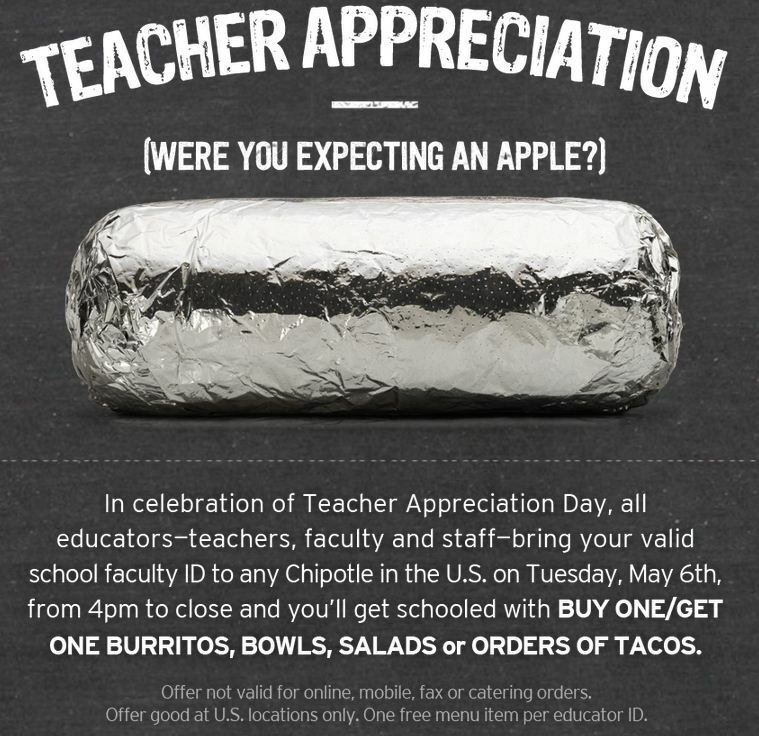 Chipotle is offering buy one; get one free on all burritos, bowls, salads, and orders of tacos with teacher id. 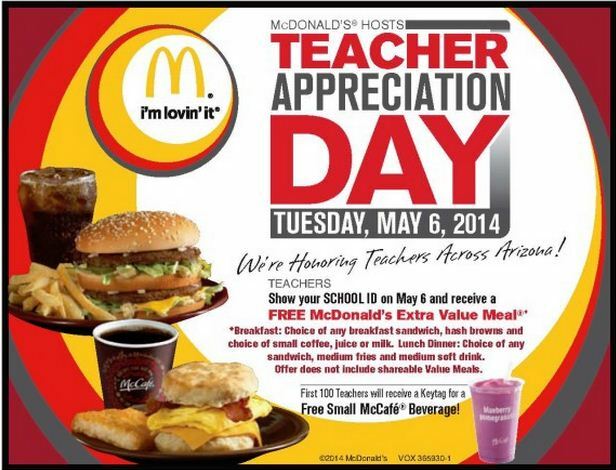 McDonald’s is honoring teachers by offering a FREE extra value meal to teachers for today only. Teachers and nurses can enjoy 30% off at New York & Company with Promo code here. Lark Creek Newport Beach will celebrate “Teacher Appreciation Month” throughout the month of May. For every teacher or school employee who presents their teacher or school employment identification while dining at Lark Creek, their first $10 spent is paid for by the restaurant, even if the bill is only $10 (excluding alcohol, tax, and gratuity). There is no limit to the number of times a teacher can visit Lark Creek, no limit to the number of teachers dining together, and no minimum purchase required. 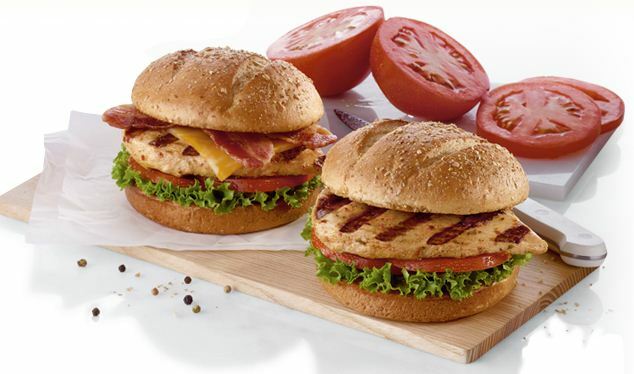 Get a FREE Chick Fil-A sandwich with teacher id. 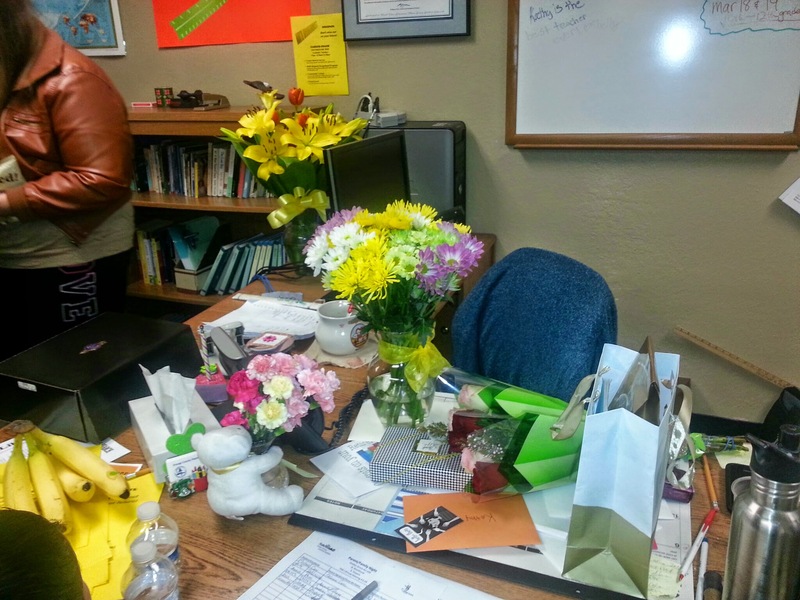 These are awesome ideas for appreciating our teachers. Thanks for sharing! What a great way to show our teachers some appreciation. I love this! I will share and make sure our teachers see it too! This is so nice of you to share this for our wonderful teachers! Great for teacher appreciation day! All teachers out there deserve the very best! Makes me *almost* wish I was a teacher or a nurse just so I could get these sweet deals! Is there a national chiropractor appreciation week?